Posted on December 29, 2017 by Sara K.
I wrote this post about my tent having toxic flame retardants. As I was writing the post, I was dimly aware that a lot of furniture in my home probably has toxic flame retardants too, and that objectively, the flame retardants in my home were probably harming much more than flame retardants in my tent. However, I had a mental block. Why? Because I’m not used to choosing furniture in my home. Until now, I’ve basically never exercised any choice about furniture in my home (except maybe something on the scale of moving a chair). I currently live in my childhood home, which means that pretty much all of the furniture was chosen by my parents, not me. I’m used to having them make decisions about adding or removing furniture, not me. In Taiwan, I only lived in furnished apartments, which meant that my landlord chose the furniture in my home (which I liked because it saved me the bother and expense of having to buy and move furniture). By contrast, I’ve generally picked out my own camping gear, so I am used to taking responsibility for whether the camping gear suits my needs and preferences. Until very recently, my bed was literally five different mattresses piled one on top of the other, all on top of a metal bed frame. I did not even know how many mattresses there were until I removed them one by one. Those mattresses have been there ever since I returned to the United States in late 2014. Were they there before I left the United States? I don’t remember. I didn’t pay attention to what my parents did to my bed when I was absent. When I returned home after my big trip this summer (2017), I noticed that the top mattress has springs which were poking through the fabric and thus poking me. This made it difficult to sleep. 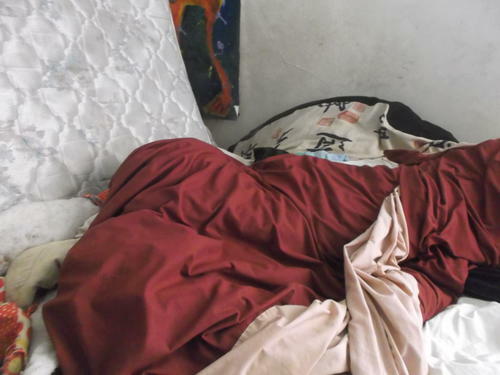 So I did the rational thing and … piled some extra sheets on top of the mattress to cushion it, and then pulled out my lightest sleeping bag to sleep inside it on top of the sheet pile. It was a decent kludge for when I wanted to go to sleep and didn’t have time/energy to do anything about the mattress. However, instead of trying to change the mattress, I just kept on using the kludge for more than two months. I took this photo while I was in the process of paring down my old bed. The mattress which was poking me in the back is leaning against the wall on the left side. Inside that mattress protector in the back of the picture was the bad feather mattress. The red thing in the foreground is a quilt which I am still using now. It eventually sunk in that, if I were concerned about exposing myself to toxic flame retardants, I could do a lot more to reduce my exposure by changing my bedroom than changing my tent. And it sunk in that changing mattresses would probably lead to better sleeping than just keeping the sheets piled on pokey bedsprings. So I finally decided to get rid of ALL of those mattresses I had been sleeping on and buy a brand new mattress. Fortunately, I made this decision just in time for Black Friday. Thus, I was able to get a traditional Japanese futon mattress (also known as ‘shiki futon’) that was made purely from organic cotton grown in Texas for less than 300 USD (including taxes). If you have any idea how expensive organic cotton is, then you appreciate what a bargain this is. Specifically, I bought this futon (Twin XL size, 3 inch, organic cotton case). Why organic cotton as opposed to ‘conventional’ cotton. This explains the difference in environmental impact. In addition to the general environmental reasons, if I’m trying to avoid toxins, it makes sense to avoid the toxins used in processing ‘conventional’ cotton. I’ve also noticed, when I compared organic cotton fabric to equivalent conventional cotton fabric, that the organic cotton fabric is higher quality and lasts longer. I think it’s worth paying triple the price to get organic cotton (I have seen a new conventional cotton shiki futon for sale for about 100 USD). I was surprised to learn that this futon is made in San Francisco. I was even more surprised to find myself visiting their factory and showroom in order to buy the futon. I have since learned that there are several businesses with mattress factories which operate in San Francisco, not just this one. Like much of the United States, San Francisco, which once had a lot of manufacturing, has been deindustrialized. Though this was not the deciding factor, I think it’s cool that I now sleep on a mattress which was made in the very same city where I’m using it, which is also the city where I’ve spent most of my life. The factory, of course, is in southeast San Francisco. I consider southeast San Francisco to be part of the rust belt. First of all, there is literally lots of rust – people who love rusty abandoned industrial buildings can have a great time in southeast San Francisco. Deindustralization has hit southeast San Francisco hard. When I hear or read about cities such as Detroit, Youngstown, Buffalo, etc., I imagine them as being like southeast San Francisco but with more land area, cheaper housing, less gentrification, and worse infrastructure. My mother expressed concern about me going to the factory/showroom – especially since it’s just a block away from Potrero Terrace, one of San Francisco’s ‘most distressed’ public housing projects – but I wasn’t worried, especially since I’ve never had a problem when I’ve walked through Potrero Terrace before (you can see what Potrero Terrace looks like in this video). Like the rest of the rust belt, southeast San Francisco has a reputation for being full of poverty and crime. Anyway, back to my new organic cotton shiki futon. Why that and not some other non-toxic mattress? First of all, it was the second cheapest new non-toxic/organic mattress I was able to find (I will discuss the cheapest, and why I decided against it, in a future post in this series). Second, it’s consistent with washitsu style. 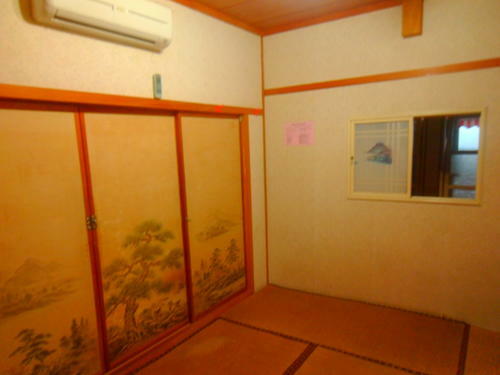 During my extensive travels in Japan, I slept in washitsu-style rooms many times and became rather fond of them. I don’t intend to converting my entire bedroom into an authentic washitsu room, but for years I’ve thought it would be nice to incorporate some of that aesthetic. And now I have. This washitsu room is actually in Rueisui, Taiwan, not in Japan. However, this inn was built when Japan ruled Taiwan to serve Japanese guests, and the innkeepers have maintained its original Japanese style. I remember that I had to pull out a futon and blankets from the closet and lay them on the tatami floor myself. Third, it did not have wool. A lot of the nontoxic mattresses use wool because it is naturally fire-resistant and a way to comply with federal fire safety laws without using toxic chemicals. However, I do not want wool because a) I do not want to exploit sheep that way and b) I don’t want a repeat of the moth infestation I experienced in my bedroom as a child. Fourth, it does not contain latex. I am only allergic to synthetic latex (or more accurately, the chemicals which are sometimes mixed with synthetic latex), not natural latex, but I still feel more secure avoiding natural latex. Fifth, I like the idea of having a portable bed. My new shiki futon only weighs about 30 pounds (14 kg) so I can easily move it without assistance. I’m going to discuss why portability is important to me in the third post in this series. The next post? I’m going to talk about what the purpose of a bed actually is. This entry was posted in Introspection, San Francisco, Society is Messed Up, Taiwan, Travel and tagged bed, Japan by Sara K.. Bookmark the permalink.